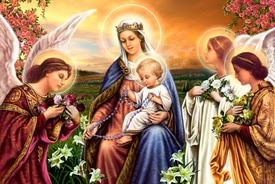 Catholic News World : How to Say the Rosary - Easy Guide to SHARE - #Rosary - Prayer will Change the World! How to Say the Rosary - Easy Guide to SHARE - #Rosary - Prayer will Change the World! He descended into Hell; the third day He rose again from the dead; He ascended into Heaven, and sitteth at the right hand of God, the Father almighty; from thence He shall come to judge the living and the dead. I believe in the Holy Sprit, the holy Catholic Church, the communion of saints, the forgiveness of sins, the resurrection of the body and life everlasting. Amen. After each decade say the following prayer requested by the Blessed Virgin Mary at Fatima: "O my Jesus, forgive us our sins, save us from the fires of hell, lead all souls to Heaven, especially those who have most need of your mercy."